Applegate produces several varieties of organic sausages. Some are made with chicken and turkey, while others use ground organic pork. 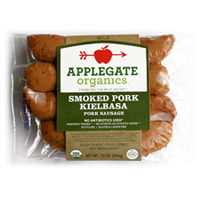 The Smoked Pork Kielbasa, like Applegate's other sausages, come pre-cooked and vacuum packed. There are four organic pork sausages per pack. The ingredients are simple and familiar. Humanely raised pork is blended with fresh garlic, salt and additional spice. The sausages are then lightly smoked. The garlic and salt flavors really stand out in this sausage. 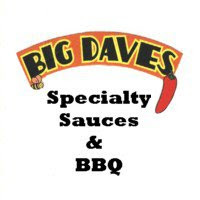 As is the case with any smoked meat, the salt content is very high (600mg per serving). The sausage has a natural casing that causes a noticeable snap when bitten into. This seemed to bother some people who had previously reviewed the product, but I didn't find it off putting. While the calorie count (190 per sausage) is pretty low, it's hard to call any smoked pork product "healthy". The sodium content of one sausage equals 25% of the recommend daily intake for an adult. Like all meat product, eat these in moderation. Again, I was impressed with the overall flavor of Applegate's kielbasa. I typically don't care much for pre-cooked sausages, but all of the Applegate products that I've sampled thus far have been very good. Learn more about Applegate Farms by clicking the title of this review. You can also see how their smoked kielbasa compares to other products on the "Product Reviews" page. 0 Response to "Applegate Farms Smoked Kielbasa"